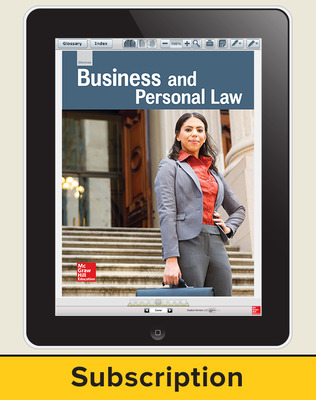 Business and Personal Law: Real-World Connections demonstrates how law, in all of its forms, affects everyone. The program covers contract law, criminal law, tort law, consumer law, employment law, family law, and much more. 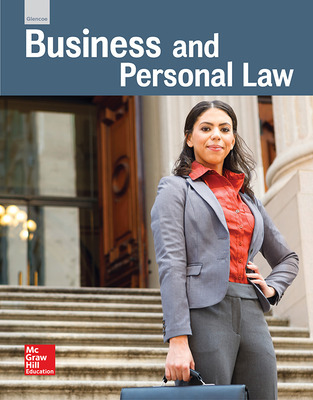 With Business and Personal Law: Real-World Connections students will grow in the knowledge of their legal rights and responsibilities. End-of-chapter activities are academically rigorous and reinforce essential concepts. Legal Briefs explain current issues in law today. Global Law explains how the laws of other countries can affect international business transactions and provides tips for having prosperous international business relationships. Business Ethics features give students practice analyzing facts and situations in order to make ethical decisions. Ask an Expert provides expert answers to basic financial questions. Legal Talk encourages students to analyze words and practice different parts of speech. Case Studies, Landmark Cases, and Cyberlaw explain the details of important court cases. 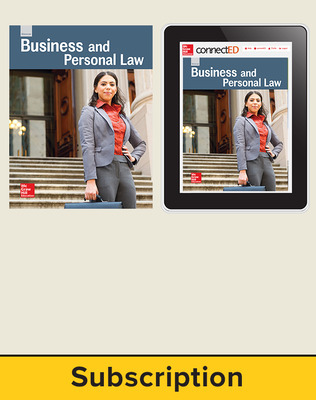 Business and Personal Law: Real-World Connections © 2016 features online resources on the MHE ConnectED platform empowering teachers to easily teach program material, manage classroom assignments, and engage students. Teachers can access the student eBook, digital resources, assessment and planning tools in one convenient location. Print teacher editions are available print-on-demand on Create™.